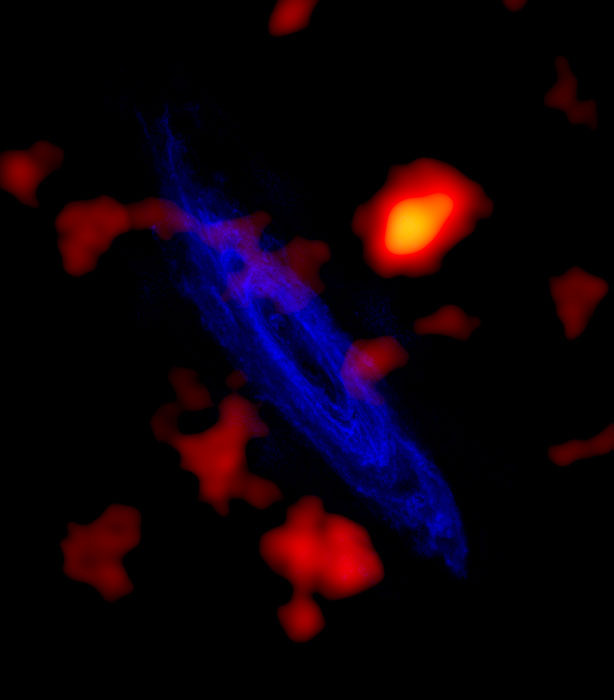 Green Bank, WV - A team of astronomers using the National Science Foundation's Robert C. Byrd Green Bank Telescope (GBT) has made the first conclusive detection of what appear to be the leftover building blocks of galaxy formation -- neutral hydrogen clouds -- swarming around the Andromeda Galaxy, the nearest large spiral galaxy to the Milky Way. This discovery may help scientists understand the structure and evolution of the Milky Way and all spiral galaxies. It also may help explain why certain young stars in mature galaxies are surprisingly bereft of the heavy elements that their contemporaries contain. in orbit of the Andromeda Galaxy (M31). "Giant galaxies, like Andromeda and our own Milky Way, are thought to form through repeated mergers with smaller galaxies and through the accretion of vast numbers of even lower mass 'clouds' -- dark objects that lack stars and even are too small to call galaxies," said David A. Thilker of the Johns Hopkins University in Baltimore, Maryland. "Theoretical studies predict that this process of galactic growth continues today, but astronomers have been unable to detect the expected low mass 'building blocks' falling into nearby galaxies, until now." Thilker's research is published in the Astrophysical Journal Letters. Other contributors include: Robert Braun of the Netherlands Foundation for Research in Astronomy; Rene A.M. Walterbos of New Mexico State University; Edvige Corbelli of the Osservatorio Astrofisico di Arcetri in Italy; Felix J. Lockman and Ronald Maddalena of the National Radio Astronomy Observatory (NRAO) in Green Bank, West Virginia; and Edward Murphy of the University of Virginia. The Milky Way and Andromeda were formed many billions of years ago in a cosmic neighborhood brimming with galactic raw materials -- among which hydrogen, helium, and cold dark matter were primary constituents. By now, most of this raw material has probably been gobbled up by the two galaxies, but astronomers suspect that some primitive clouds are still floating free. Previous studies have revealed a number of clouds of neutral atomic hydrogen that are near the Milky Way but not part of its disk. These were initially referred to as high-velocity clouds (HVCs) when they were first discovered because they appeared to move at velocities difficult to reconcile with Galactic rotation. Scientists were uncertain if HVCs comprised building blocks of the Milky Way that had so far escaped capture, or if they traced gas accelerated to unexpected velocities by energetic processes (multiple supernovae) within the Milky Way. The discovery of similar clouds bound to the Andromeda Galaxy strengthens the case that at least some of these HVCs are indeed galactic building blocks. Astronomers are able to use radio telescopes to detect the characteristic 21-centimeter radiation emitted naturally by neutral atomic hydrogen. The great difficulty in analyzing these low-mass galactic building blocks has been that their natural radio emission is extremely faint. Even those nearest to us, clouds orbiting our Galaxy, are hard to study because of serious distance uncertainties. "We know the Milky Way HVCs are relatively nearby, but precisely how close is maddeningly tough to determine," said Thilker. Past attempts to find missing satellites around external galaxies at well-known distances have been unsuccessful because of the need for a very sensitive instrument capable of producing high-fidelity images, even in the vicinity of a bright source such as the Andromeda Galaxy. One might consider this task similar to visually distinguishing a candle placed adjacent to a spotlight. The novel design of the recently commissioned GBT met these challenges brilliantly, and gave astronomers their first look at the cluttered neighborhood around Andromeda. The Andromeda Galaxy was targeted because it is the nearest massive spiral galaxy. "In some sense, the rich get richer, even in space," said Thilker. "All else being equal, one would expect to find more primordial clouds in the vicinity of a large spiral galaxy than near a small dwarf galaxy, for instance. This makes Andromeda a good place to look, especially considering its relative proximity -- a mere 2.5 million light-years from Earth." What the GBT was able to pin down was a population of 20 discrete neutral hydrogen clouds, together with an extended filamentary component, which, the astronomers believe, are both associated with Andromeda. These objects, seemingly under the gravitational influence of Andromeda's halo, are thought to be the gaseous clouds of the "missing" (perhaps dark-matter dominated) satellites and their merger remnants. They were found within 163,000 light-years of Andromeda. Favored cosmological models have predicted the existence of these satellites, and their discovery could account for some of the missing "cold dark matter" in the Universe. Also, confirmation that these low-mass objects are ubiquitous around larger galaxies could help solve the mystery of why certain young stars, known as G-dwarf stars, are chemically similar to ones that evolved billions of years ago. As galaxies age, they develop greater concentrations of heavy elements formed by the nuclear reactions in the cores of stars and in the cataclysmic explosions of supernovae. These explosions spew heavy elements out into the galaxy, which then become planets and get taken up in the next generation of stars. Spectral and photometric analysis of young stars in the Milky Way and other galaxies, however, show that there are a certain number of young stars that are surprisingly bereft of heavy elements, making them resemble stars that should have formed in the early stages of galactic evolution. "One way to account for this strange anomaly is to have a fresh source of raw galactic material from which to form new stars," said Murphy. "Since high-velocity clouds may be the leftover building blocks of galaxy formation, they contain nearly pristine concentrations of hydrogen, mostly free from the heavy metals that seed older galaxies." Their merger into large galaxies, therefore, could explain how fresh material is available for the formation of G-dwarf stars. The Andromeda Galaxy, also known as M31, is one of only a few galaxies that are visible from Earth with the unaided eye, and is seen as a faint smudge in the constellation Andromeda. When viewed through a modest telescope, Andromeda also reveals that it has two prominent satellite dwarf galaxies, known as M32 and M110. These dwarfs, along with the clouds studied by Thilker and collaborators, are doomed to eventually merge with Andromeda. The Milky Way, M33, and the Andromeda Galaxy plus about 40 dwarf companions, comprise what is known as the "Local Group." Today, Andromeda is perhaps the most studied galaxy other than the Milky Way. In fact, many of the things we know about the nature of galaxies like the Milky Way were learned by studying Andromeda, since the overall features of our own galaxy are disguised by our internal vantage point. "In this case, Andromeda is a good analogue for the Milky Way," said Murphy. "It clarifies the picture. Living inside the Milky Way is like trying to determine what your house looks like from the inside, without stepping outdoors. However, if you look at neighbors' houses, you can get a feeling for what your own home might look like." The GBT is the world's largest fully steerable radio telescope.